The Peavey Black Widow 1502 DT speaker is a 15-inch Black Widow speaker with a straight-sided Kevlar impregnated cone for the durability required to handle pounding bass lines. Mainly designed for bass guitar, the 1502 is flexible enough to be used for guitar, keyboard, or any low frequency sound reinforcement. The 1502 DT is outfitted with medium length voice coils for high output and efficiency. Peavey's comprehensive broad range of over-the-counter speaker components offer both the sound professional and the working musician an extensive assortment of quality components. From the Low Rider sub woofers, with incredible power handling capacity and impressive bass response to the steadfast Black Widow and BWX speakers with replacement basket assemblies, the Peavey line of speaker components is consistent and innovative. Another Peavey original is the design of the speaker framework. In the unlikely event of the failure of a Black Widow loudspeaker, the cone/basket assembly is field replaceable with a factory assembled and tested replacement basket assembly. Instead of being forced to obtain a speaker, only a basket assembly is required. Lightweight and relatively inexpensive, the replaceable basket assembly offers an easy solution to spares and repairs. 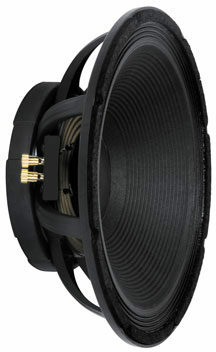 The Peavey Black Widow speaker line: The high technology performer that is unsurpassed. - Packed Weight: 19 lbs. - Packed Width: 18 in. - Packed Depth: 17.25 in. - Packed Height: 6.25 in. This review has been selected by our experts as particularly helpful. "PEAVEY 15" Black Widow - lots of bottom"
51 of 56 people (91.07%) found this review helpful. Did you? Sound: I played straight noise and 5 string thrash through two of these for days. I punched a hole in one of the baskets, fixed it with rubber cement, keeps on going!! handles every instrument. lots of lower grind but can also whistle and crack. you can put them in a crappy cabinet, drag them around by the nose, get rain on them, they keep going (i should know). Feature: speakers, dude. Ease of Use: Plug and play. Quality: Kevlar dude. Fix tears with rubber cement. Value: When you're ready to quit playing Sublime covers get one of these. Manufacturer Support: didnt use them cause mine are second hand. The Wow Factor: Lust? Get a job! Overall: Fine speakers, especially in pairs.